"Mars is the appropriate goal for the human space flight program." Both chambers of Congress just passed the NASA Authorization Act of 2017. With this transformative development, the space agency got a lot more than just $19.508 billion in funding. They also got a very clear mandate: Get humanity to Mars. To be clear, Mars has been in the works for some time; however, the 2017 Act places a strong emphasis on this goal, making it the focal point of NASA’s long-term plans. In the document, congress asserts that the space agency is to get humans “near or on the surface of Mars in the 2030s.” Opposition to the bill from the administration isn’t expected, so it’s more than likely to be passed into law by the presidency. 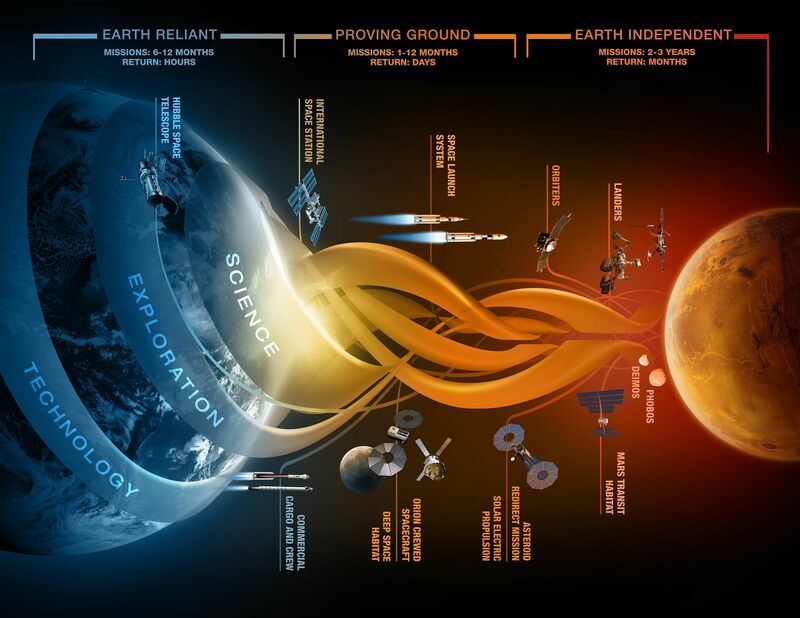 In order to get to Mars by the 2030s, Congress is asking NASA to develop “an initial human exploration roadmap” that must be submitted before December 1, 2017. With these planned phases, NASA should be able to easily provide Congress with the roadmap that it’s asking for. Through this new NASA Authorization Act, Congress affirms that “Mars is the appropriate long-term goal for the human space flight program,” and it is likely that the Moon will be a stop over in 2020, if the current administration’s plans push forward. Recently, much of the news covering missions to Mars involved private space companies, most notably, SpaceX and foreign space agencies — including China and the UAE. According to SpaceX CEO Elon Musk, the company will create a permanent Martian settlement. To that end, Musk’s plan includes the launch of the unmanned “Red Dragon” spacecraft by 2018, then sending a new and reusable rocket by 2022 (which will be powered by the just recently tested Raptor rocket), and eventually launching humans to Mars after that—hopefully landing by 2025. However, much of the details still need to be fleshed out. To say, however, that NASA has been sitting idly by would be inaccurate. The space agency has been “on a journey to Mars” for some time. So, what has NASA been up to in relation to the Red Planet? The agency already has a host of rovers currently on Mars. One, the Curiosity rover, has made much headway in helping us better understand how much water did (and maybe still does) exist on Mars. Another rover is planned for 2020. This Mars 2020 rover will gather and study data on the availability of resources, such as oxygen, on Mars. In this respect, Sending rovers is one of the first steps in getting people to Mars. Ultimately, in the end, getting humans to Mars isn’t some empty obsession. It’s a worthwhile endeavor—one that has the potential to inspire generations in the same manner that the Apollo missions (and Moon landing) did. For many, getting to Mars would be the highest point of human exploration they would ever witness. Think of what New Horizon’s arrival at Pluto felt like, and now multiply that by about 100. Already, Mars rover missions are accelerating innovation and research exponentially, so think of all the things that we could learn once we’re actually there. It is a bold new era in the final frontier.